Help : The Import Natural Account Window is an interim table which is used when importing external data into the system. Selecting the 'Process' button will either add or modify the appropriate records. 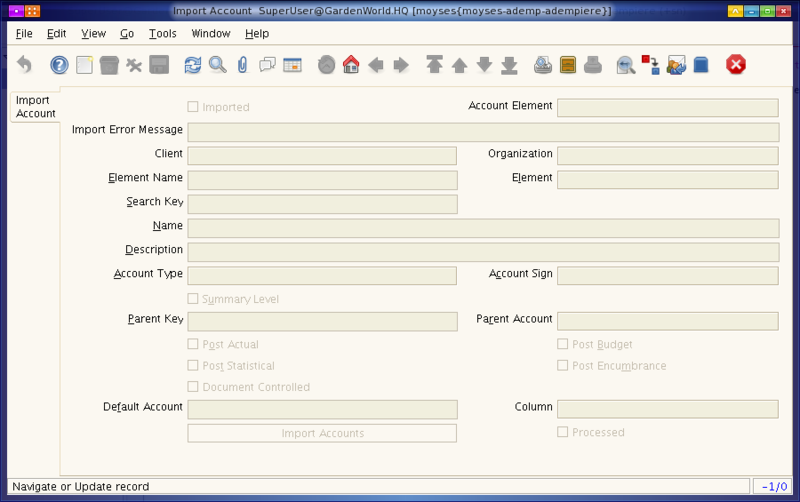 Import Accounts Import Natural Accounts Import accounts and their hierarchies and optional update the default accounts. Updating the Default Accounts changes the natural account segment of the used account, e.g. account 01-240 becomes 01-300). If you create a new combination, the old account (e.g. 01-240) will remain, otherwise replaced. If you select this, make sure that you not multiple default accounts using one natural account and HAVE A BACKUP !! When you use the Import Loader (below) to import the accounts into the above screen, you can press the Import Accounts button at the bottom to begin the process. There may be a few errors due to starting blank records which won’t affect the results as all the right records are in. This page was last modified on 3 March 2009, at 17:16.